Afghanistan, Angola, Argentina, Armenia, Australia, Azerbaijan, Bangladesh, Belarus, Belgium, Brazil, Burkina Faso, Cameroon, Canada, Chad, Chile, China, Congo, Côte d’Ivoire, Cuba, Denmark, Ecuador, Egypt, Ethiopia, Fiji, France, Germany, Ghana, Greece, Guinea, Hungary, India, Indonesia, Iran, Iraq, Ireland, Israel, Italy, Japan, Kazakhstan, Kenya, Kuwait, South Korea, Lebanon, Libya, Madagascar, Malaysia, Mali, Marshall Islands, Mauritania, Mexico, Moldova, Morocco, Mozambique, Nauru, Netherlands, New Zealand, Niger, Nigeria, Norway, Pakistan, Palau, Papua New Guinea, Paraguay, Peru, Philippines, Poland, Qatar, Russia, Saudi Arabia, Senegal, South Africa, Spain, Sudan, Sweden, Syria, Tanzania, Thailand, Tunisia, Turkey, Tuvalu, Uganda, Ukraine, United Arab Emirates, United Kingdom, United States of America, Uruguay, Venezuela, Vietnam, Zimbabwe. Quite a trip around the world! When looking at their respective demographics, economic situations and food security status possible future scenarios can arise from this list. The most obvious is probably that many countries on this list have little food security. Considering that many of these countries have a young, poor and increasing population, political stability is quite fragile. As long as this remains, the consequences of food inflation must be taken very seriously. What came to my mind when I saw the list the first time was the following. The cluster Pakistan-India-Bangladesh represents 22.2% of the world population. This region is very sensitive to climate events, as the current floods in Pakistan demonstrate. The monsoon is the main factor that influences the level of crop production. These countries are below food self-sufficiency, and their agricultural infrastructure (and overall infrastructure in general) is in bad need for further development. However, the quality of agricultural land is good with around 40% of arable land. The task of India is huge. It has about 70% of its population in agriculture, and if the USA had India’s population density, there would be 3 billion Americans, 10 times its current population. In such a situation, the USA would not be self-sufficient, either. Agricultural reforms are necessary to improve yields and economic development is necessary to provide more inhabitants with higher revenue. It will take time, but expectations for the Indian economy are positive. Subsistence is not a good economic model. A good relationship between India and Pakistan is paramount for the stability of the region. A stable Pakistan is essential for the stability of the world. In North America, I can see dramatic change coming. With two countries, Mexico and the USA, in sharp contrast with each other in the top 16, something will happen. The USA will remain an economic superpower and any events in that country will affect the world economy and politics. Mexico is growing but it needs to improve its economy and achieve better social stability. Poverty is fuelling many issues and the price hike of corn of 2008 has showed that it would not take much to cause food riots. The issue of immigration of Mexicans into the US will not go away, and no wall will stop it, especially with Mexico having a strong population increase. The difference in population numbers of the two countries will shrink. The USA and Mexico will have to develop a joint economic development program for the region to avoid an uncontrollable situation in the long term. I think that we will see more and more Mexicans settling in the USA and become the farmers of the future over there. However, climate conditions will probably affect the geographical distribution of productions. The southwest of the USA is increasingly suffering from water scarcity, and the area spreads. This will affect the distribution of the population over the continent, and it will affect Canada as well. South East Asia has three representatives on this list: Indonesia, The Philippines and Vietnam. This region shows a strong population increase. From a food production point of view, geography tells that aquaculture has to be a leading, if not the leading, food source for the future. And this is exactly the direction that these countries are following. Rice is essential in this part of the world, and there is no doubt that the South East Asian Emergency Rice Reserve will be tested at some point in time. Brazil is growing, demographically and economically. It is becoming an economic powerhouse, in particular in agricultural products. However, much still needs to be done to improve infrastructure and performance. In the future, I expect to see joint agricultural policies between a number of Mercosur countries, especially with Brazil, Chile, Argentina and Uruguay as the initiators. Export has led agricultural production of these countries in the past, but I expect to see them to rebalance policies towards feeding the South America market as well in the years to come. The other thing that jumped out of the list is Africa. I doubt that many people would have expected Nigeria to be ranking #7. Africa will be an important element in the 21st century economy. The continent’s population will double in the coming 40 years and many African countries are attracting foreign investments. If this happens in orderly manner, which is far from sure at this stage, I would expect Africa to experience a boom comparable to the one that China has had over the last three decades. The continent is open for business and the rules of engagement are exactly what adventurous pioneers can wish for. Africa has tremendous potential for food production and foreigners are developing agriculture actively for their own food supply, but neither African countries nor investors should forget to include the Africans in the wealth creation, and help them earn the money to feed themselves. What will happen in Africa, will affect all of us. Funny how coincidences occur. In less than two weeks, I heard several times about Soylent Green, the futuristic movie. It came first in a couple of conversations I have had about the book I am about to publish (hardcopy proof is on its way to me), and it came up in the very serious French economic paper Les Echos, too. Considering the area I am involved in, I had to find out more about Soylent Green. Soylent Green is a movie made in 1973, starring Charlton Heston. As such, I would not describe Soylent Green as a great movie, but it contains some interesting elements that resonate in today’s environment. To sum it up, the action takes place in a devastated New York in 2022, where 40 million people live is dismal conditions. The planet is in bad shape, the economy is just as bad and food is scarce. A powerful multinational, Soylent Corporation controls food supply, thanks to its very successful product Soylent Green, a high protein food. Natural foods are very difficult to find. Strawberries sell for $150 a jar and to get beef, one needs to have the right connection. Cooking is a lost art, but some still have the nostalgia of the yesteryears, when life was good. Although made around the time of the first oil crisis, it mentions very current topics, such as a collapsing economic system, greenhouse gases and the power of multinationals over our food supply. That is not bad, considering, it is almost 40 years old, an age than more than half of the world population has not reached yet. The author certainly had a strong vision of where our world is heading. 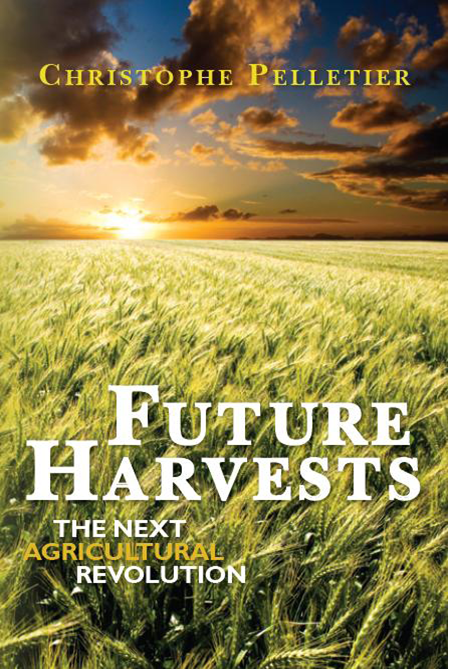 For those who may worry, my book envisions the future of food production from a very different angle. With obesity on the rise in more and more countries and legions of diets with little results, if any, I had been thinking about writing something about proper nutrition and some of the key physiological mechanisms involved in human metabolism. It is a bit away from envisioning the future, although the fight against obesity will gain momentum in the years to come. There are many misconceptions out there. For instance, we all have heard that carbohydrates are not good, fat is not good or meat is not good. This is total non-sense. Carbohydrates, fat and protein are good. Actually, they are indispensable to our health. What is bad is too much, especially too much of the nutritionally poor quality carbohydrates, fats and protein sources. Obesity and overweight are increasing health issues. In the world there are about as many overweight people as they are people suffering from hunger: around one billion people in each group. What causes overweight? The answer is simple. A person gains weight when he/she ingests more calories than he/she burns. The cause can be either too rich a diet and/or not enough physical activity. In most cases, it is a combination of both. The source of unburned calories are metabolized into fat and stored in the fat tissues. This is a problem, because fat tissues are poorly irrigated with blood vessels. This makes the stored fat difficult to eliminate. The body will use calories coming from the meals before it uses the fat reserves. This is why it is so difficult to get rid of extra pounds. The only way to use the fat reserves is through long intensive physical activity. Some might wonder why our body does not tell us when to stop eating. Actually the body does, through two physiological mechanisms. One is a mechanical mechanism. When the stomach is stretched, the nervous system sends the information to the brain that the stomach is full and the brain makes us stop eating. The other mechanism is biochemical, through the blood composition, the brain sensors can detect when we have ingested enough energy, and the brain makes us stop eating. We feel “full”. This could make you think that we should never overeat because the brain would let us know on time. Theoretically, this is true but the modern lifestyle has found a way of deceiving the brain. The biochemical mechanism takes time to react. It needs to detect a glycaemia level high enough to act. When we eat food and beverages that are highly concentrated in energy, and therefore have a relatively small volume, we ingest more calories than we would need before the stomach gets stretched, and before the glycaemia level rises in the blood to the normal level. Such foods are generally low in fibre and high in fat, such as fried foods. Soft drinks are not filling and they contain many calories. You can imagine the result of a combo bacon cheeseburger-French fries-pop package meal! The carbohydrates that they contain pass in the blood almost instantaneously. One of the advantages of fibre-rich food, such as fruit and vegetables, is that they fill the stomach and contain relatively few calories per volume unit. This activates the mechanical nervous mechanism and limits our food intake much faster than foods with little fibre. Do not fool yourself! The little leaf of lettuce in your burger is not enough to protect you. This brings me to talk about carbohydrates. There are two types of carbohydrates: the slow ones and the fast ones. The main representative of slow carbohydrate is starch. Starch is a long molecule that does not get into the blood stream as such. When we consume starch in bread, rice, pasta or potatoes, the starch gets cuts in a smaller component, called glycogen. The glycogen is stored in the liver where it waits for instructions from the brain to be released in the blood stream. This happens through a biochemical mechanism. The brain sensors detect a state of hypoglycaemia, and it orders the liver to release the glycogen. As long as our liver still has glycogen in store, we do not feel hungry. The system regulates itself smoothly. When we run out of glycogen, which is between 2 and 4 hours after the meal, we get into a hypoglycaemic state and we feel hungry. Usually it happens around 11.00 am and noon. That is why lunch exists! Same thing happens around 5.00 pm. Starch is good and necessary for us (as mentioned before, too much, on the other hand, is not). The second group of carbohydrates, the fast ones, follows a different process. This group consists of what we call sugars, such as saccharose, fructose or glucose. When ingested, they do not get stored for later release, unlike starch. They flow into the bloodstream almost instantaneously and there are two possible scenarios. If our activity level is high enough when we consume them, they are burned to provide us with energy. If our activity level is too low for the amount we consume, our metabolism deals with the fast carbohydrates in only one manner: it transforms the sugars into fat that then get stored in the fat tissue. This is why drinking large amounts of pop or snacking on candy bars while sitting on your couch watching TV or playing video games will make you fat. There again, the rule is enough sugar to sustain yourself is good, too much consumption is bad. About fat, I can tell a similar story. Within the amount necessary to allow all our functions to work properly, fats are fine. As their name indicates, essential fatty acids are indispensable. Even the dreaded cholesterol is an essential element for us. What is not good is to consume too much fat, and to consume too much of the less good ones. The length of the carbon chain, the level of saturation and the configuration of the molecules also affect your health. The excess of fat in your diet will end up as fat deposit in your body. This is why potato chips while watching TV will hurt you, too. Protein is good, but with moderation as well. As for the other elements, too much protein can cause some problems, as protein stored in the intestine before release will not ferment, unlike fibre, but will undergo a rotting process, resulting in the production of harmful amines. The kidneys have also more work to do, and a long exposure to a diet too rich in protein may cause kidney problems. So, what is the lesson from all of this? For me, it is that food one of the enjoyable things in life, as long as it is consumed with moderation (an incidental excess once in a while is fine, too; it means that you enjoy life) and it goes together with a healthy lifestyle. A person should have 7 hours of physical activity (the kind that makes you sweat) per week. Also, remember that the best is to not gain extra pounds in the first place, because the fat tissue is remarkably persistent. Copyright 2010 – The Happy Future Group Consuting Ltd.
You are currently browsing the The Food Futurist blog archives for August, 2010.